Alive Music Studios, is proud to announce the booking of Top Stand Up Comedian “Tank Sherman” to appear at the alive music Studio Bar on Sunday, 9th September 2012. The show starts at 9pm and is followed by some great music by the well know local dynamic duo called “Funky Acoustica” which play music to meet everyone’s taste. This is a VIP event, so you will be up close and personal with our guest celebrity guest comedian Tank Sherman. Tickets cost £7 each and the event is suitable for over 18s only. You can buy tickets now online from http://www.eventbrite.com/directory/United+Kingdom/Wadebridge There are some Early Bird Tickets available at £5 each first come first serve. Standard tickets are just £7 each and its £7 per person on the door. Tank was born in The West Country at the age of 0. He is one of twins not identical though, because his sisters got a beard! He came from a poor background and even had to wear one of his sisters old dresses to school on one occasion. Imagine his total surprise when he realised that his teacher was wearing the same dress! No one could tell who was more embarrassed, Tank or Mr Jones! His first introduction to comedy was when he was invited to give an after-dinner speech at the National Psychics Association in Bournemouth. It was a strange night. Half the audience left because they didnt like the jokes he was about to tell! 1983 was a year that saw many changes, particularly to the Irrigation System of Chiles Inland Rice-Paddies. But thats another story… He was encouraged into show business by his Great Grandfather, who was one of Britains top psychics, Seymour Sherman. Able to predict the future, his greatest feat was when he announced to the worlds press the minute, to the hour, to the day, to the month, to the year, when he would die! (Apparently the judge told him!) Tanks powers let him down one night when he suffered an asthma attack! He was beaten up by ten asthmatics! The police didnt understand why he hadnt heard them coming?! In 1997, Tank spent a lot of money on a beautiful salt water aquarium at his home. He purchased half a dozen very rare Patagonian jelly fish to grace the beautiful glass tank, but the very next morning Tank was in tears. Overnight, all the jelly fish had set! Tragedy also struck his family on the 100th Birthday of his Great Gran Freda. She died at her birthday party, half way through the bumps! I hope this lot of waffle shows you the type of person Tank is. With a penchant for the stupid / daft jokes in life, things came to a head in July 1999, when he appeared in front of millions on the Les Dennis ITV talent show… ‘Give Your Mate A Break’… he won! Tank is happy performing to a crowd that is out for a laugh, and can turn his hand to all audiences. So with possibly a sprinkling of magic, poetry, a song and sometimes the most ridiculous Quiz Show you could ever be present at, Tank will have em rolling in the aisles and shouting for more. 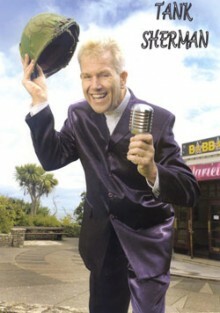 With many performances under his belt, he has brought his own kind of humour to the West Country. Always highly praised and we could bore you here with reviews from bookers but we lost both bits of paper!